Turkish investigators looking into the killing of journalist Jamal Khashoggi will present Saudi Arabia's top prosecutor with a 150-page dossier and request another joint search at the kingdom's consulate in Istanbul, according to a Turkish source. Saudi prosecutor Saud al-Mojeb will meet on Monday Irfan Fidan, the Istanbul chief public prosecutor, to discuss the latest findings in Khashoggi's case, who was murdered in the consulate building on October. His trip to Istanbul on Sunday comes amid Turkish suggestions of a lack of cooperation by the Saudi side - despite a joint investigation group - and alleged attempts to spoil evidence. According to a source at the prosecutor's office, who spoke to Al Jazeera on condition of anonymity, Fidan will ask al-Mojeb to conduct a joint search at the consulate. 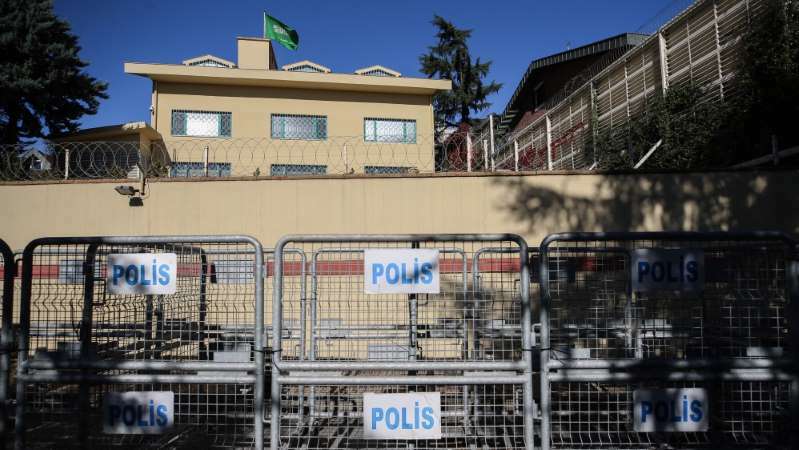 The source said that when Turkish investigators first entered the building in mid-October they were not allowed to search three rooms that had been locked by the Saudi staff. Police were also not allowed to search a 20-metre-deep well located in the consulate’s garden. As previously reported by Turkish media, the Saudis did not let the investigators call a fire brigade team to go down the well, and the search ended with police obtaining some water samples. In Monday's meeting, the Turkish dossier presented to al-Mojeb will include interviews with 45 consulate employees. According to the source, the file also identifies four people as the prime suspects of Khashoggi's killing but names only three of them: Saudi Consul-General Mohammed al-Otaibi, forensics expert Saleh al-Tubaiqi and Maher Abdulaziz Mutreb, who was identified as being part of a 15-member team of suspected Saudi agents who flew into and out of Istanbul on October 2, the day of Khashoggi's disappearance after entering the consulate to obtain paperwork needed for his upcoming marriage. The third person that will be presented as a main suspect is an unnamed "local collaborator" who, according to Riyadh, was given Khashoggi's body in order to dispose it. The file also contains evidence from the crime scene as well as CCTV footage of Saudi diplomatic vehicles. It will also include the four telephone conversations between Khashoggi and the Saudi consulate officials before his October 2 visit. In one of the calls, the source said, Khashoggi was invited to the consulate. The dossier will also contain the phone records - but not the calls’ content - of the 15-member Saudi squad that flew in and out of Istanbul on the day Khashoggi was killed. For its part, the Saudi prosecutor is expected to present the statements of 18 suspects arrested in Saudi Arabia in connection with Khashoggi's killing. However, following Saudi Foreign Minister Adel al-Jubeir's recent statement that those behind the killing would be prosecuted in the kingdom, and that the investigation would take time, a senior official in Ankara told Al Jazeera that Riyadh may not be willing to share the suspects' statements - or at least would only share parts of them. Turkish President Recep Tayyip Erdogan has called Khashoggi's killing a premeditated, political murder, insisting the suspects be put on trial in Turkey despite the consulate building being Saudi territory. Saudi Arabia's narrative surrounding the circumstances of Khashoggi's death has changed significantly over the past few weeks. After initially denying allegations that Khashoggi never left the consulate, Riyadh later admitted that the journalist was killed inside the building - but has still made no mention of where his body is. Meanwhile, unnamed Turkish officials have drip fed details of his killing to the media, which resulted in increased international pressure on the Saudis. Since then, Erdogan has been insisting the Saudis reveal the location of Khashoggi’s body and name the "local collaborator", as well as the person who had ordered the murder. Salih Zeki Iskender, former head of the First Civil Chamber at the Court of Cassation in Turkey, said an indictment can be filed even without Khashoggi's body. He added, however, that his death must be proved by other evidence and that finding the body is crucial to identifying the nature of the offence. "The Saudi step to admit this was a murder is very important,” said Iskender. "However, I don't believe that Saudis will be able to establish justice, considering the Saudi attempts to spoil some of the evidence." Separately, international law professor Hasan Koni said Turkey and Saudi do not have an extradition treaty between them. Koni said Turkey will seek to establish justice by all means, but added that some of its efforts may be blocked by international law and diplomatic restrictions. "However, sua sponte (on their own accord), the UN has the right to ask for prosecution stating it is a crime against humanity, and ask the International Criminal Court to open a probe," said Koni, but downplayed the chances of that happening due to a possible veto of the United States - a Saudi ally - at the Security Council.